Our Children's Worship Bulletins are jam-packed with fun and engaging pictures, mazes, codes and other puzzles. Each biblically based Sunday school bulletin is designed for kids ages 3-6 or ages 7-12. Familiar Scripture passages, stories or themes from the Old Testament, the Gospels or the Epistles are used to create bulletins with activities that kids love. In this short article, we've included two examples of Sunday school activities about Isaac and Rebekah that you can use with our Children's Worship Bulletins to make Sunday school fun for your children! Divide the class into teams of two children each. Give each team a bulletin, crayons or colored pencils and a pair of scissors. Have each team work together to color the six panels in the "Rebekah agreed to go to meet Abraham's son" puzzle from the bulletin. When everyone has finished coloring, have the teams carefully cut out each panel. Explain the object of this activity. "You've probably noticed that there are just three different pictures that you've cut out. There are two of each of the three pictures, making six pictures altogether. You're going to take turns trying to match all the pictures. Here's how you play this game. First, turn over all six pictures so that you can't see which ones match. Next, move the pictures around to mix them up. When they're mixed up, arrange them into three rows, leaving them turned over so that you can't see the pictures. Working together, turn over one picture. Look at it carefully. Turn over one more picture. Does it match the first one you turned over? If so, take both pictures out of play. If not, turn both pictures back over in their original places. Turn over another picture. Look at it. Turn over another picture. Does it match? If so, take them out of play. If not, turn them back over. Continue turning over two cards, one at a time, to try to find all three matches." After the children have had a while to try to match all the picture pairs, read aloud the story from Genesis 24:34-67 to the class. Reward everyone with small prizes. Explain this activity. "The object of this activity is to be the first to complete the "Isaac and Rebekah" maze and correctly write at the bottom of the page what the servant prayed to God. You may turn over your bulletins when I say, 'GO!'" When everyone appears ready, say, "GO!" and wait for the first child to finish. Check the winner's work. If they have correctly written the answer at the bottom of the page, reward them with a small prize. Read aloud the story of Isaac and Rebekah from Genesis 24:34-67 to the class. We guarantee that you will love the relevant, fun material in each Children's Worship Bulletin. With a membership, you'll have access to more bulletins and activities — at any time — than you'll find anywhere else. And here's our guarantee: If you're ever dissatisfied with Children's Worship Bulletins, we'll cheerfully issue a full refund — no questions asked. 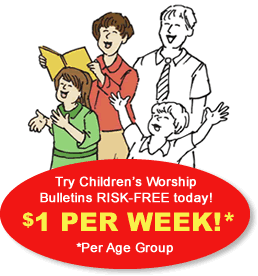 Yes, we're that sure that you'll love Children's Worship Bulletins!